The beloved 1993 coming-of-age baseball film is the latest Disney-owned property to get the reboot treatment. David Mickey Evans, who directed the 1962-set film and co-wrote it with Robert Gunter, is working on the reboot for the upcoming streaming service. Last month, Evans teased the reboot reboot on The Rain Delay podcast, saying there was already a two-season order. "I just sold a Sandlot television show," he said. "We're about to get an order for the first two seasons...I already got all the original cast members back. It takes place in 1984, when they’re all, like, 33 years old and they all have children of their own, and that's all I can tell you.” According to The Hollywood Reporter, all of the original stars will return. 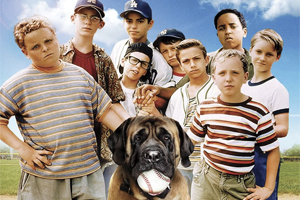 The Sandlot's cast reunited one year ago this week for the movie's 25th anniversary.